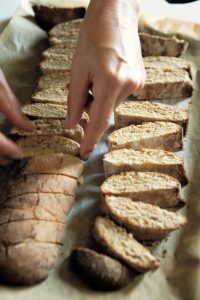 Patrice Newell's olive oil biscotti | Patrice Newell's online organic biodynamic Australian garlic and olive oil. I love these for dunking! And they keep for ages in an air tight jar. A variation with nuts and spices provides endless deliciousness. Quickly mould dough halves into two long logs; it shouldn’t be handled too much as this affects the texture. Bake logs on a baking tray lined with baking paper for 20 minutes or until firm. Remove from oven and cool for 5 minutes or until you can handle it easily. Using a serrated knife, cut slices from the loaf, on an angle, to the size you want, then place slices flat on the baking tray and return to oven for another 10–15 minutes or until golden. You can bake them on both sides, but I usually don’t as this makes the biscuits very hard and I want to keep my teeth!